You would be forgiven for not being all that familiar with the music of Alessandro Stradella (1643–1682) or, at least, not in its original form. Despite fame during his lifetime, Stradella’s reputation didn’t endure much beyond his murder in Genoa. This following an earlier assassination attempt in Turin, the result of a rather dangerous love life. Perhaps it is no surprise that there are as many operas written about him, as he wrote himself. He is perhaps best known today as the posthumous provider of music for Handel to pinch, notably in Israel in Egypt. But he is also justifiably held to be responsible for many musical innovations in Baroque music, not least as the instigator of the Concerto Grosso and in the development of new forms, including what became the ubiquitous da capo Aria form of 18th-century opera. 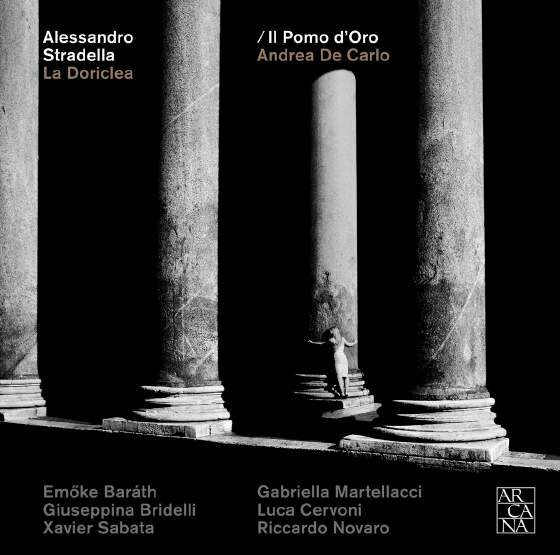 This world premiere recording of La Doriclea, the least known of Stradella’s operas, is the fifth release in The Stradella Project. It was composed in Rome during the early 1670s and reflects the 17th-century Spanish ‘comedy of intrigue’ genre. It is approachable and straightforward, with a plot that doesn’t addle the brain, attractive music with simple instrumental textures (using just two violins and a continuo section of bass viol, cello, violone, theorbo, archlute, harp, harpsichord and organ. There are just six vocal soloists, helpfully one from each voice part, including a mezzo, countertenor and contralto, alongside a soprano, tenor and buffo baritone. There is a wide range of musical styles and moods with a generous sprinkling of comedy, notably through the character of Giraldo, here sung by baritone Riccardo Novaro together with his comic partner Delfina, sung by contralto Gabriella Martellacci. The other two couples are Emőke Baráth (Doriclea) & Xavier Sabata (Fidalbo) alongside Giuseppina Bridelli (Lucinda) & Luca Cervoni (Celindo). The three CDs sensibly occupy one Act each. The piece opens with a recitative, as indicated in the score. That is not unusual for a second or third Act opening, but it rather unusual for the start of an opera. It would have benefited from something instrumental to introduce the opera. Apart from that, this is a most impressive recording, well played and sung and directed with sensitivity and insight by Andrea De Carlo. The recording quality is technically impressive, although some might find the singers a little too forward in relation to the orchestra. The booklet has English and French translations of the Italian libretto.